Whether you are looking for a tabletop exercise, full scale simulated natural or manmade disaster, or something in between. Our staff’s experience as Professional Firefighters and Fire Service instructors gives us a unique expertise in facilitating Emergency Response Drills. We can develop and facilitate simple unannounced emergencies involving select facility personnel to large-scale planned drills involving multiple business units and off-site agencies. Our staff will work with your management team to develop an emergency drill that maximizes its effectiveness as a testing and/or learning tool for your entire business emergency plan or that targets a specified area of the emergency management system at your facility or business. We have developed and conducted emergency preparedness and response drills for clients ranging from a single worksite with a handful of employees to university campuses involving multiple colleges and departments. 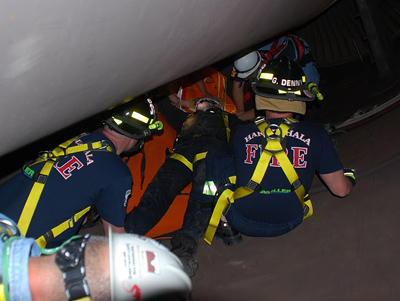 For drills involving off-site agencies, our staff takes the lead in coordinating with off-site agencies, such as fire, ambulance, police, and private contractors to minimize the time required of your management team in developing and executing the emergency drill. During the drill, we both facilitate and observe and analyze the actions of those involved and the execution of documented plan with experienced emergency responders and incident commanders to ensure maximum effectiveness of analysis of the exercise. After, conclusion of the exercise, our experienced facilitators and observers, conduct a both a debriefing session to maximize the learning opportunity for all participants while the exercise is fresh in everyone’s minds and we provide your management team with a detailed written follow-up report providing a summation of the facilitated drill and a detailed description of noted deficiencies in Plant preparedness and response to the emergency and recommended corrective actions. If you wish to test your Emergency Management System to identify deficiencies in Protocols and/or personnel training, let us work with you to develop and facilitate a drill designed to meet your needs.